Synthetic peptide within Human CDKN2A/p16INK4a aa 100 to the C-terminus (C terminal). The exact sequence is proprietary. WB: HeLa, HEK-293, HEK-293T, and Saos-2 cell lysates. 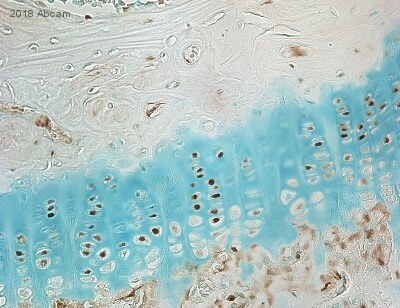 IHC-P: Human cervical carcinoma tissue. ICC/IF: HeLa cells. Flow Cyt: HEK-293 and HeLa cells. IP: HeLa cell lysate. Our Abpromise guarantee covers the use of ab108349 in the following tested applications. Immunohistochemistry (Formalin/PFA-fixed paraffin-embedded sections) - Anti-CDKN2A/p16INK4a antibody [EPR1473] - C-terminal (ab108349)Image from Shan M et al., PLoS One. 2013;8(10):e76408. Fig 1.; doi: 10.1371/journal.pone.0076408. eCollection 2013. Formalin-fixed, paraffin-embedded human normal breast, luminal-A DCIS (ductal carcinoma in situ) and triple negative breast cancer tissues stained for CDKN2A/p16INK4a using ab108349 in immunohistochemical analysis. Immunohistochemistry (Formalin/PFA-fixed paraffin-embedded sections) analysis of human cervix carcinoma tissue labeling CDKN2A/p16INK4a with purified ab108349 at 1/100. Heat mediated antigen retrieval was performed using Tris/EDTA buffer pH 9. ab97051, an HRP-conjugated goat anti-rabbit IgG (H+L) was used as the secondary antibody (1/500). Immunocytochemistry/Immunofluorescence analysis of HeLa (Human epithelial cell line from cervix adenocarcinoma) cells labeling CDKN2A/p16INK4a with unpurified ab108349 at a dilution of 1/100. Immunohistochemistry (Formalin/PFA-fixed paraffin-embedded sections) analysis of human cervical carcinoma tissue labeling CDKN2A/p16INK4a with unpurified ab108349 at a dilution of 1/250. ab108349 (purified) at 1/30 immunoprecipitating CDKN2A/p16INK4a in HeLa (Human epithelial cell line from cervix adenocarcinoma) cell lysate. For western blotting, a peroxidase-conjugated goat anti-rabbit IgG (H+L) was used as the secondary antibody (1/1000). Flow Cytometry analysis of HEK-293 (Human epithelial cell line from embryonic kidney) cells labeling CDKN2A/p16INK4a with purified ab108349 at 1/270 (red). Cells were fixed with 2% paraformaldehyde. A FITC-conjugated goat anti-rabbit IgG (1/150) was used as the secondary antibody. Black - Isotype control, rabbit monoclonal IgG. Blue - Unlabeled control, cells without incubation with primary and secondary antibodies. Overlay histogram showing HEK-293 (Human epithelial cell line from embryonic kidney) cells stained with unpurified ab108349 (red line). The cells were fixed with 4% paraformaldehyde (10 minutes) and then permeabilized with 0.1% PBS-Tween for 20 minutes. 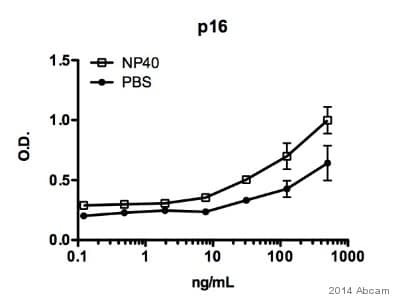 The cells were then incubated in 1x PBS / 10% normal goat serum / 0.3M glycine to block non-specific protein-protein interactions followed by the antibody (ab108349, 1/100) for 30 minutes at 22ºC. The secondary antibody used was DyLight® 488 goat anti-rabbit IgG (H+L) (ab96899) at 1/500 dilution for 30 minutes at 22ºC. Isotype control antibody (black line) was rabbit IgG (monoclonal) (1µg/1x106 cells) used under the same conditions. Acquisition of >5,000 events was performed. This antibody gave a positive signal in HEK-293 cells fixed with 80% methanol (5 minutes)/permeabilized with 0.1% PBS-Tween for 20 minutes used under the same conditions. I have a customer wishing to take part in your Abtrial program.